You can easily wire this breakout to any microcontroller, we'll be using an Arduino. For another kind of microcontroller, just make sure it has I2C capability, then port the code - its pretty simple stuff! Open up the serial console and hold the vibration motor between your fingers. You can also string together multiple effects in a row, up to 7. Check out the complex example sketch, and setWaveform for each slot. The last slot should be set to 0 to indicate its the end. When you are ready to place the full waveform sequence, send the go() command! 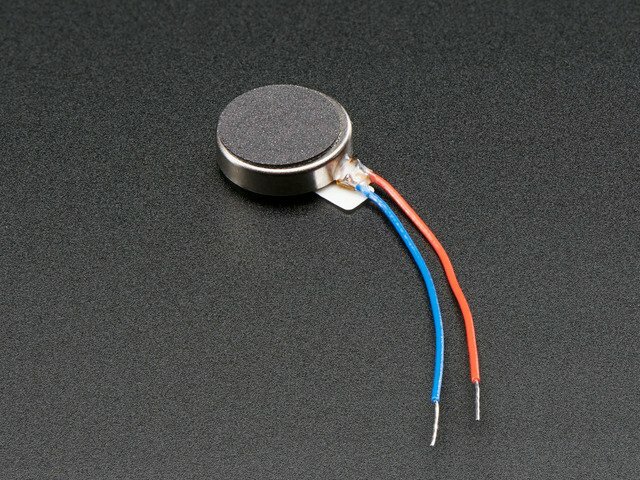 You can also turn the DRV2605 into an audio-to-vibration driver. Use a 1uF capacitor in series to line level voltage audio into the IN pin, then load up the audio example sketch. If you don't feel anything, try boosting up the source audio volume, it has to be pretty loud! This guide was first published on Dec 17, 2014. It was last updated on Dec 17, 2014. This page (Arduino Code) was last updated on Apr 22, 2019.